A select group of 20 participants from 12 different countries make up the exciting line-up of the 15th Poetry Africa international poetry festival. Hosted by the Centre for Creative Arts (University of KwaZulu-Natal) and made possible through core funding from the National Lottery Distribution Trust Fund and other valued partners, Poetry Africa runs in Durban from 17 to 21 October at the Elizabeth Sneddon Theatre, with the festival finale at BAT Centre on 22 October. Poetry Africa touring programmes will also feature in Malawi, Zimbabwe, Johannesburg and Cape Town between 8 and 15 October. The impressive diversity of the programmes will appeal to all poetic palettes, and audiences can expect sharp social and political commentary, innovative, insightful and deeply personal approaches to poetry, streetwise and sassy performances, and a strong spike of contemporary rap and hip hop. With the COP 17 conference on climate change taking place in Durban in November the legendary teaser presentation of all the poets on opening night, 17 October, will focus on environmental and planetary challenges. Thereafter, the general Poetry Africa format is for five poets to perform each evening, with the exception of the festival finale at Bat Centre on closing night. Tuesday 18 October features Dashen Naicker, Myesha Jenkins, Khadijatou, Raul Zurita and Shailja Patel. A visible presence on the Joburg scene for the past 15 years, activist, writer and performer Jenkins, was last seen on Durban stages in the Feelah Sistah Collective in 2005. Prior to her stage appearance, Jenkins will be launching her second collection of poetry, Flight of Dreams. UK-based Khadijatou is well-known through underground poetry and jazz scenes, for her voice and signature djembe drum. She is also the founding director and producer of Step Afrika! Bursting through the ranks in recent years is Durban-born poet Dashen Naicker, and winner of the Durban SlamJam at last year’s Poetry Africa. One of Latin America’s most powerful and controversial voices is Chilean poet Raúl Zurita, whose numerous awards include the Chilean National Prize for Literature and a Guggenheim Fellowship. Zurita’s Dantean trilogy of books about the demise that followed the military overthrowing of democracy in Chile, was composed over a span of 15 years. Shailja Patel of Kenya has been chosen as the 2011 Letters to Dennis poet, a programme slot instituted last year in honour of late activist and poet Dennis Brutus. Trained as a political scientist and accountant, this brilliant poet and committed activist is a founding member of Kenyans for Peace, Truth and Justice (KPTJ). The recipient of numerous awards and with work translated into 15 languages, Patel was named by the African Women's Development Fund as one of Fifty Inspirational African Feminists for the 100th anniversary of International Women’s Day. Starting with a brief performance by Zimbabwean mbira maestro Chiwoniso, music elements are prominent in the Wednesday programme on 19 October that showcases Patrice Treuthardt (Reunion), Uzinzo, TJ Dema (Botswana), Jaap Blonk (Netherlands), and Didier Awadi (Senegal). Patrice Treuthardt is an advocate for the preservation of the Creole language in Réunion, Treuthardt defied the nation’s official ban and his first book of poetry in 1978, was a long poem written entirely in Creole. The poetry of Eastern Cape-born, Cape Town-based artist, Uzinzo, deals with personal and spiritual identity, exploring the struggles and victories of a young African man in modern day society. Dynamic spoken-word artist TJ Dema is also chairperson of The Writers Association of Botswana.. and the founding member of the Exoduslivepoetry! collective, who have coordinated Botswana’s sole annual poetry festival since 2004. Self-taught composer, performer, musician and poet Jaap Blonk from The Netherlands, has developed a unique form of sound poetry that absolutely challenges pre-conceptions of what poetry, and language, should be. Closing the evening is Senegal’s Didier Awadi, one of the most prominent artists to have emerged from Africa’s Francophone rap scene. With lyrical content underpinned by a strong African consciousness, Awadi skillfully fuses western aesthetics and African heritage. Thursday 20 October commences with the awarding of the Sol Plaatjie European Union Poetry Award, and in the book launch slot immediately prior to the show Jacana will unveil an anthology of poetry submitted for the competition. Featured poets for the night are David wa Maahlamela, Fernando Réndon (Colombia), Sandile Dikeni, Niyi Osundare (Nigeria) and Oswald Mtshali. Poet and prose writer David wa Maahlamela.is the recipient of a number of awards, including the PanSALB Multilingualism Award, notably being recognized for his work in arts development in the Limpopo province. With three excellent collections of poetry to his credit, provocative wordsmith Sandile Dikeni makes a much-welcomed return to the Poetry Africa stage where he last performed exactly ten years ago. Fernando Réndon is an exceptional Colombian poet and visionary who founded the Latin American poetry magazine, Prometeo, and co-founded the International Poetry Festival of Medellin. Now acknowledged as the world’s largest poetry festival, it received in 2006 the Right Livelihood award, commonly referred to as the Alternative Nobel Prize. Réndon also initiated the recently formed World Poetry Movement. Thursday also includes the prolific and award-winning Niyi Osundare. A leading figure in the popularization of written poetry in Nigeria, with over 16 poetry books, four plays, two books of essays and numerous scholarly articles and reviews, Osundare’s works have been translated into numerous languages. Returning to the province of his birth is a giant of the South African literary landscape, Oswald Mtshali. His seminal first book, Sounds of a Cowhide Drum (1971), which explored the banality and extremity of apartheid through the eyes of working men in South Africa, was one of the first books by a black South African poet to be widely distributed. Mtshali’s numerous awards include the South African Lifetime Achievement Literary Award (SALA) from the Department of Arts and Culture in 2007. The programme of Friday 21 October kicks off with poetry from the winners of the Poetry Africa schools poetry competition, before Phelelani Makhanya, Dikson (Zimbabwe), Mphutlane wa Bofelo, Gabeba Baderoon and Joshua Bennett (USA) take to the stage. Phelelani Makhanya is a member of Uhuru Poets, based at the Luthuli Museum, and Bare Thoughts at the University of Zululand where he works. A regular participant in Durban poetry circles, Mphutlane wa Bofelo has published a number of poetry books, articles and stories. He is a previous winner of the Poetry Africa SlamJam. From Zimbabwe, and a well-respected poet on the spoken word and slam scene there, is Dikson. Dikson has also collaborated on a number of fusion projects, including with the all-female ensemble WoCalling. Author, academic, and celebrated poet, Gabeba Baderoon, has produced three well-received collections of exquisite poetry - she is recipient of the DaimlerChrysler Poetry Award amongst others. Bound to raise the early-weekend tempo will be award-winning US-born performance poet Joshua Bennett. Bennett has recited at events such as The Sundance Film Festival, the NAACP Image Awards, and President Obama’s Evening of Poetry and Music. Five talented Poetry Africa Prelude Poets have been selected as a preface to the main line-up on certain evenings. Zuhaira ‘Lerato’ Esau and Sifiso Mtolo present their poetry on Tuesday, 18 October; Tumelo Khoza and Juba deliver on Wednesday, 19 October; and Siyabonga Mpungose appears on Friday, 21 October. Festival book launches all take place at the Wellington Tavern Deck, Elizabeth Sneddon Theatre, from 18h45-19h15. Myesha Jenkins’ Dream of Flight (Gecko Publishing) will be launched on Tuesday, 18 October, while No Serenity Here (World Knowledge Publishers) by Phillippa Yaa de Villiers, Isabel Ferrin-Aguirre and Xiao Kaiyu, will be launched on Wednesday, 19 October. Thursday, 20 October sees the launch of The Sol Plaatje European Union Poetry Anthology 2011 (Jacana Media), while Conduit by Sarah Frost (Modjaji Books) is to be launched on Friday, 21 October. Music performances also include the eclectic Sazi Dlamini and Ndikho Xaba, and a rocking finale on closing night by Tidal Waves. The busy day programme includes seminars, workshops and activities at tertiary institutions and community centres, engagement with local poetry groups, a prison poetry programme, open mic opportunities and visits by the poets to thirty schools in Durban and surrounding areas to exchange poetry and ideas about poetry with young learners. The high-paced Durban SlamJam takes place at 16h45 at BAT Centre on Saturday 22 October, featuring Dikson, Mphutlane wa Bofelo, Dashen Naicker, Joshua Bennett and Sandile Dikeni. Ticket prices at the Elizabeth Sneddon Theatre: R30 (R15 for students and pensioners). Book at Computicket (Tel: 083 915 8000 or www.computicket.com) or at the Elizabeth Sneddon Theatre from 18h30. Closing night at the BAT Centre: R50. There is no charge for workshops and seminars. No advance bookings for BAT Centre. Poetry Africa performance showcases take place in Blantyre (8th October), Johannesburg (11th), Harare (13th), and Cape Town (15th) with seminars, workshops, talks, panel discussions and schools programmes in some of the centres. The tour includes a number of participants who do not feature in the afore-mentioned Durban programme, such as Kwame Dawes, Chris Abani, Lebo Mashile and Chiwoniso. Acclaimed writer of poetry, fiction, nonfiction and plays Kwame Dawes, who was born in Ghana but spent most of his childhood and early adult life in Jamaica. He is also an actor, playwright, producer, broadcaster, and was the lead singer in Ujamaa, a reggae band. Winner of a Pushcart Prize, Dawes has produced a prolific sixteen collections of fine poetry. Controversial Nigerian-born Chris Abani’s first novel got him arrested, and his play Song of a Broken Flute (1990), resulted in a sentence as a political prisoner. He is the recipient of major PEN awards, and his most recent book of poetry, Sanctificum (2010), is a sequence of linked poems, combining religious ritual, the Igbo language of his Nigerian homeland and reggae rhythms. Always a popular performer is the iconic South African poet, MC, actress, television presenter and producer Lebo Mashile, who in 2006 was awarded the Noma Award for Publishing in Africa for her first poetry collection. Adding a musical touch is Chiwoniso (Zimbabwe), who has emerged as one of the defining experts in the art of mbira playing, accompanied by her incredible singing. Other participants on the tour include Didier Awadi (Senegal),TJ Dema (Botswana), Shailja Patel (Kenya), Jaap Blonk (Netherlands), Khadijatou (UK), Tibass Kangu (DRC). Gabeba Baderoon and Sandile Dikeni present in Cape Town; Myesha Jenkins and Oswald Mtshali in Johannesburg. Talented Malawian poets Babangoni Kubvala Chisale, Benedicto Wokomaatani Malunga and Qabaniso ‘Q’ participate in the Blantyre Showcase; Zimbabweans Dikson and Xapa will share their skills in Harare. 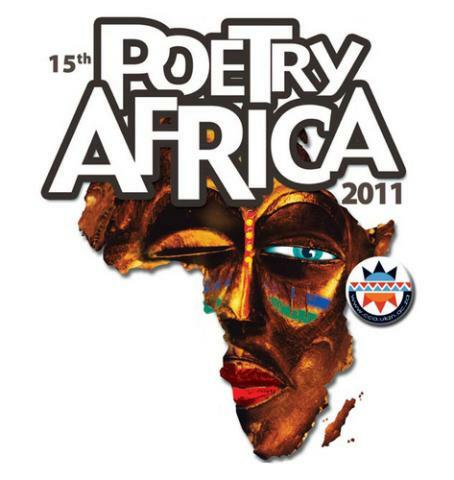 Organized by the Centre for Creative Arts (University of KwaZulu-Natal), the 15th Poetry Africa International Poetry Festival is supported by the National Lottery Distribution Trust Fund (principal funder), Humanist Institute for Development Cooperation (HIVOS), Mimeta, French Institute of South Africa and the City of Durban.